Afshari, H., Sajjadmanesh, M. (2015). Fixed point theorems for $\alpha$-contractive mappings. Sahand Communications in Mathematical Analysis, 02(2), 65-72. Hojjat Afshari; Mojtaba Sajjadmanesh. "Fixed point theorems for $\alpha$-contractive mappings". 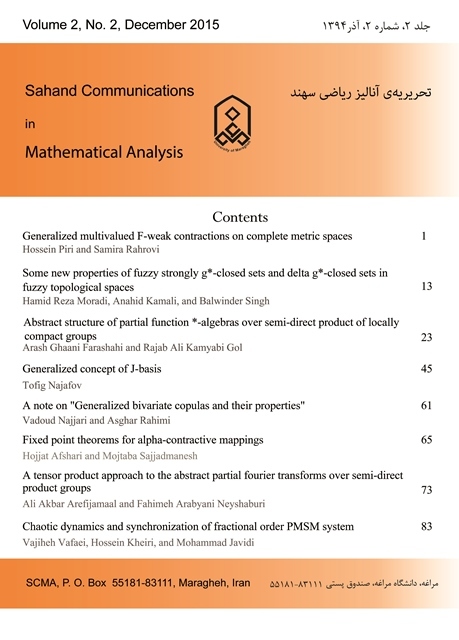 Sahand Communications in Mathematical Analysis, 02, 2, 2015, 65-72. Afshari, H., Sajjadmanesh, M. (2015). 'Fixed point theorems for $\alpha$-contractive mappings', Sahand Communications in Mathematical Analysis, 02(2), pp. 65-72. Afshari, H., Sajjadmanesh, M. Fixed point theorems for $\alpha$-contractive mappings. Sahand Communications in Mathematical Analysis, 2015; 02(2): 65-72. Faculty of Basic Science, University of Bonab, P.O.Box 5551761167, Bonab, Iran. In this paper we prove existence the common fixed point with different conditions for $\alpha-\psi$-contractive mappings. And generalize weakly Zamfirescu map in to modified weakly Zamfirescu map. D. Ariza-Ruiza, A. Jimenez-Melado, A continuation method for weakly Kannan maps, fixed point theory and applications, (2010), Art. Id 321594, 12pp. D. Ariza-Ruiza, A. Jimenez-Melado, Genaro Lopez-acedo, A fixed point theorem for weakly Zamfirescu mappings, Nonlinear analysis (2010). S. Banach, Sur les operations dans les ensembles abstraits et leur application aux equations integrals, Fund. Math., 3 (1922) 133-181. S. K. Chatterjea, Fixed-point theorems, C. R. Acad. Bulgare Sci., 25 (1972) 727-730. J. Dugundji, A. Granas, Weakly contractive maps and elementary domain invariance theorem, Bull. Soc. Math. Greece (N. S) 19, No.1 (1978) 141-151. R. Kannan, Some results on fixed points, Bull Calcutta Math. Soc., 60 (1968), 71-76. B. Samet, C. Vetro, P. Vetro, Fixed-point theorems for α-Ψ-cotractive type mappings, Nonlinear Analysis (2011), . T. Zamfirescu, Fixed-point theorems in metric spacesArch. Math., 23 (1972), 292-298.